HOUSTON (ICIS)--US spot ethylene values dropped to a 19-year low on Thursday as supply remains ample and sentiment remains weak. Front-month April ethylene traded at 13.00 cents/lb, matching a low last seen in January 1999. The Thursday trade was down from trades at 13.50-13.75 cents/lb in the previous day. Ethylene spot values have been trending lower in 2018 as new ethylene capacity has overtaken consumption from new downstream capacity. Two new ethylene units with a combined 3m tonnes/year of capacity, and several new polyethylene (PE) units with a combined 3.5m tonnes/year of capacity, have started up since late 2017. Despite the increased PE capacity, ethylene consumption into PE has been lower than expected, and ethylene supply has lengthened. The new PE capacity has struggled to reach full capacity, with plants facing issues of specification, certification and logistics. Also, existing PE plants had production issues during January and February. Meanwhile, ethylene production from existing crackers in 2018 has been good. There have been few outages, most of which have been relatively short. Sentiment has weakened as the ethylene market waits to see if PE production rates will increase before additional ethylene capacity comes online. The next start-up is expected to be the ExxonMobil cracker, a 1.5m tonne/year unit. "If they don’t have their PE issues lined out before that cracker starts up, this will get even messier," a market source said. Further weakening ethylene sentiment in April was China's proposed 25% tariffs on some grades of US PE. 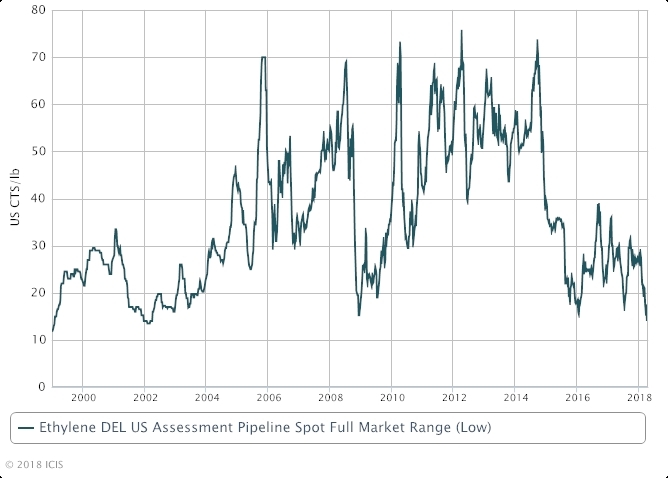 Spot ethylene dropped to a 16-year low on 6 April when the proposed tariffs were announced. However, US PE market participants have expressed no great concern over the proposed tariffs. Some expect the tariffs may not be imposed, while others expect US exports could move into other markets.